Description: Terrestrial herbs, sympodial; roots filamentous; tuberoids paired and often also produced at apex of stolons. 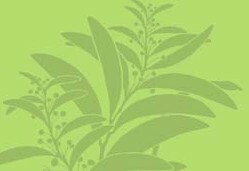 Leaves absent or in a rosette on a shoot separate from the flowering stem [or basal], 2–6 per shoot, convolute, petiolate or sessile. Inflorescence racemose, several–many-flowered, terminal; flowers not resupinate [or resupinate]. Dorsal sepal free, about as long as, or longer than lateral sepals. Lateral sepals free or decurrent on column foot. Lateral petals free, about as long as, or shorter than dorsal sepal. 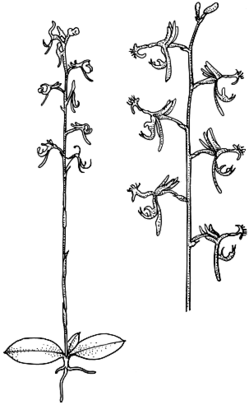 Labellum free, hinged to column foot by a short to elongated claw; lamina oblong to 3-lobed, grading into, or peltate to the claw, highly ornamented with a combination of tufted hairs, fringing cilia, warty appendage and knobbed calli. Column lacking free filament and style; column wings fused to column, expansive near the middle to form 2 elongated arms, forming teeth at the apex that project conspicuously [or shortly] beyond the anther. Column foot longer or shorter than column. Anther erect, persistent. Pollinia 4, soft and mealy. Stigma entire. Rostellum obscure, ventral. Distribution and occurrence: World: 10 species, Australia, New Guinea. Australia: 10 species (8 species endemic), all States except W.A.